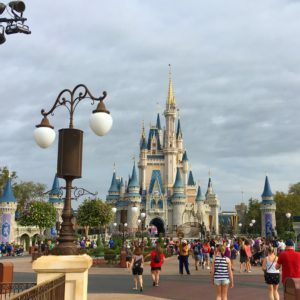 Sponsored post – Walt Disney World hosted us. All opinions are my own. Disclaimer: The time of year, and how busy the parks are when you visit will have a large affect on how well “One Day in Disney” plan is executed. We visited during the regular (not peak) season. Park hopper tickets are essential to this plan. Disney has two options for tickets, park hopper and base tickets. If you plan to just do one park per day, then it is cheaper to purchase base tickets. If you plan to visit more than one park in a day, that can only be accomplished with a park hopper ticket. Obviously, we purchased park hoppers and took advantage of them! Fast Passes are key to being able to ride so many popular attractions in a short amount of time. If you are staying in an offsite (non-Disney) hotel, you can reserve three Fast Passes, for rides in one park, 30 days before the date of your visit. 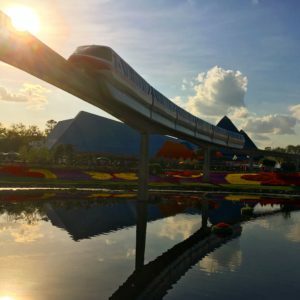 If you are staying onsite, at an official Disney Resort, you can reserve passes, for rides in one park, 60 days in advance. Since we were trying to ride the major attractions, the park with the most attractions we wanted to ride was Magic Kingdom. It also has many sought-after rides such as Seven Dwarf’s Mine Train, Space Mountain, Big Thunder Mountain. Magic Kingdom is also where we planned to start our day, so I reserved Fast Passes for Seven Dwarf’s Mine Train, Space Mountain, and Haunted Mansion. We stayed off site, so we reserved Fast Passes 30 days in advance. We arrived at the gates a half an hour early, got inside the park, and waited at the rope to go back in to Frontierland to go to our first two destinations of the morning: Big Thunder Mountain and Splash Mountain. We decided to go to Big Thunder Mountain first, as we thought that guests would not be as interested in Splash Mountain (getting wet), so early in the day (even though it was gorgeous Florida weather). When the park officially opened, the group that stood with us at rope drop was escorted to Big Thunder Mountain by Disney Cast Members. We were walked directly to the queue, as that was where pretty much everyone was going. Luckily, being this early allowed us to be in the second train out of the station that morning, and we accomplished our first ride very quickly. Next, we immediately went to Splash Mountain, and only waited for one or two boats before we got on. Our next ride was a fast pass, Space Mountain, and we had plenty of time to get there. Since we couldn’t reserve any more fast passes until our original three were used, we walked leisurely to Tomorrowland. When our Fast Pass window opened, we rode Space Mountain with only about a five minute wait. After Space Mountain, I thought it would be a good time to get some food, but it was still quite early in the day. We were one of the first orders placed at Cosmic Ray’s Starlight Cafe. Since we had arrived at the park so early, it was only around 10AM, but we were so hungry it felt like lunch time. After “lunch” we headed to Seven Dwarf’s Mine Train. This had been the hardest Fast Pass to get, as it is the newest ride in Magic Kingdom. The line was already quite long, maybe an hour or so, and the Fast Pass line also took us a bit longer than other Fast Pass lines, maybe 10 minutes. We had a drink to finish from Cosmic Ray’s, so we didn’t mind the longer wait. Next, we headed to Haunted Mansion and because we were hitting the beginning of our Fast Pass windows, we had some time to rest in between. This was the last of our three original Fast Passes, so as soon as I scanned in at Haunted Mansion, I got immediately on the Disney World app to reserve our next Pass. This is where the plan diverged and became more spontaneous. The availability of additional Fast Passes would begin to dictate our day. I saw that a Fast Pass for Expedition Everest (the main, large roller coaster at Animal Kingdom) was available at 11 AM. That was the only ride we were planning to hit at Animal Kingdom, since I knew there was no way we’d luck into Fast Passes for any ride in Pandora. Those rides are just too new and popular, and really weren’t the focus of this trip (we were saving them for our next trip with the whole family). It was important to calculate transportation time between the parks when reserving Fast Passes now. We were standing in line for Haunted Mansion, and reserving a Fast Pass for a roller coaster near the back of another park. I knew buses would run pretty frequently between Magic Kingdom and Animal Kingdom, and we had an hour window to use our Fast Pass with a 15 minute grace period (or so I heard – I’ve never used a Fast Pass after the window in order to tell if this is true). I gave us an hour to get to Animal Kingdom, and I thought that was plenty of time, before we got stuck on Haunted Mansion! Really, we were only stuck for about five minutes, but it’s just an example of how you have to go with the flow. Granted, I was on this “haunted” ride with a six year old, and we were stuck in one of the scariest rooms of the mansion, however, she’s really good at knowing what’s real and what’s fake and just for fun. The ride only paused briefly, and we were on our way to Animal Kingdom quickly. We caught the bus and walked through the gates of Animal Kingdom and directly to Expedition Everest. Hopped on this beautifully themed and amazingly fun roller coaster (my six year old stated that it was her new favorite coaster! ), and were quickly finished. 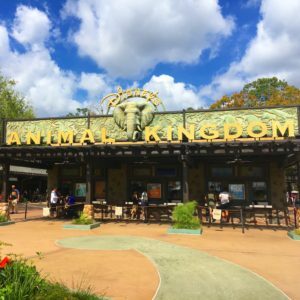 Animal Kingdom was quite busy, and I attributed that to the awesome new land of Pandora – The World of Avatar. It was beginning to get hot, and it was nearing noon. I easily caved when my daughter asked me for an ice cream cone. We were halfway finished with the parks, and I thought it sounded like a good, and refreshing, reward. Of course, immediately after we entered the Expedition Everest queue, I reserved the next Fast Pass for Rock n Roller coaster at Hollywood Studios. We hopped on the bus for Hollywood Studios and were quickly on our way. There were two rides I was planning to accomplish at this park: Rock ‘n’ Roller coaster and Tower of Terror. We’ve ridden Toy Story Mania a bunch of times in previous trips, so I wanted to focus on the two main attractions that my daughter had recently grown tall enough to ride. We headed straight to Rock ‘n’ Roller coaster and rode what I now consider one of my favorite coasters! I’m a sucker for a ride with onboard theme music. Next we lucked into a Tower of Terror Fast Pass, and hopped on that quickly. After the Tower, I was able to find a Fast Pass for Toy Story Mania, but it was for two hours from the current time. We had some popular rides I wanted to get on at Epcot, and since Toy Story was not a priority for this trip, we decided to move on. This time, we opted for a different mode of transportation between parks, a boat! I had read that a boat connects Hollywood Studios and Epcot, and we were actually ahead of schedule at this point! It was only around 4 PM in the afternoon, which meant we had over four hours to get to and enjoy Epcot. The boat was a great way to relax after our busy afternoon, and it was also key to me getting the next Fast Pass. When we got on the boat, the only time I could find for a Test Track Fast Pass was 8 PM. After tons and tons of app refreshing, by the time we exited the boat I had a Fast Pass for 5 PM! That goes to show you should just keep trying. One thing I didn’t realize is that the boat drops you off at the “International Gateway” at Epcot, which is at the back of the park! It wasn’t a huge problem, but I didn’t even realize this entrance and exit existed. When we exited the boat, we saw Princess Tiana, which ended up being the only princess we got a photo with that day. Princesses were no longer our focus, since our six year old had already grown out of that stage. We walked and walked around the countries, as my daughter decided she wanted Chinese food for dinner, and it was a bit of a walk from the International Gateway. When we finally left World Showcase and entered Future World, we found a fun splash pad. It was a great way to cool off and wait for it to be time for our Test Track Fast Pass. We rode Test Track for the first time ever, and really enjoyed it! Next, we headed to Soarin’ which we have ridden in the past, but it is on our cannot-miss list. Getting a Fast Pass for Soarin’ was easier than Test Track, so we hopped right on. And that is the end of the major attractions we wanted to ride! Our bus was due to pick us up in the Epcot parking lot at 9 PM, so we had time to get on some extra rides, such as The Seas with Nemo and Friends and Spaceship Earth. We also walked by the Big Hero 6 meet and great, so we met Baymax quickly before heading out of the park. We were exhausted, but had such a great day! Hopefully this inspires you to visit Disney World, even if you only have one day available to go. If you plan accordingly, and you’re flexible, it’s fun to see how much you can fit into your day!